At Stock Informer we provide up to the minute stock alerts for Stinky the Garbage Truck. Our servers track both online stock and High Street Shops and provide a free email and text messaging service for Stinky the Garbage Truck. Friday 26 Apr - Latest - Stinky the Garbage Truck has now been discontinued. Stinky the Garbage Truck is a real working garbage truck brought to life. Brought to you by Matchbox, Stinky is the latest edition to the Big Rig Buddies collection. Stinky the Garbage Truck has a brand new personality and articulation from his buddy Rocky the Robot Truck and is fully interactive buddy by talking, telling jokes (bad ones! ), sings, excercises and eats! Gobbling garbage is his game! Stinky the Garbage Truck has many features including Motion, Direction, Container and Belly sensors. He is activated by sound and talks with his speakers and features motorized movement with the ability also to stand up on his rear wheels. Stinky will even fall asleep and start to snor during periods of inactivity. Boys (and some girls!) of 3 years plus will just love Stinky the Garbage Truck with his talking, singing and dancing that Stinky brings to playtime! Many new fun surprises await with over 90 funny sounds and phrases. Stinky the Garbage Truck is smart. He knows when he's hungry and even will let you know when he wants to dump! For simple push around play, Stinky can also function as a freewheeling garbage truck by switching off his motors and mouth! 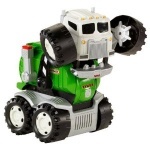 Stinky the Robot Truck is a solid, robust and high-quality toy who can handle a lot of rough and tumble. 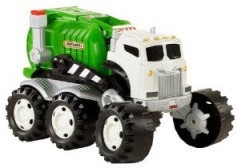 Stinky the Garbage Truck requires 4 x C Batteries (which are included). Stock shortages are expected this Christmas 2010 with Stinky predicted to be one of the hot sellers. At Stock Informer we will keep you updated with the latest stock updates and price comparisons taking the stress out of this purchase.